The Generative Theory of Tonal Music (GTTM) was developed in the early 80s by composer Fred Lerdahl and linguist Ray Jackendoff. GTTM "relates the aural surface of a piece to the musical structure unconsciously inferred by the experienced listener." In 2002 I began working with Fred Lerdahl to write software that performs a GTTM analysis on music written in the style of Bach chorales. 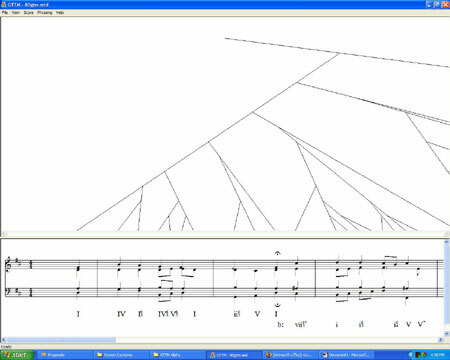 The result is a program that creates a visualization of unconscious musical structures. It also performs a complete Roman numeral analysis. For more info, see the FAQ.